The Dressing Room was created in 1800 from the design by Giacomo Quarenghi, who gave it an austerely classical decor. Its walls faced with white stucco panels, with borders of the same material, are finished with a wide painted grey and greenish frieze articulated with moulded corbels. The frieze and ceiling were both done in grisaille by Giovanni Scotti. The classical door cornices emphasize the severe architecture of the interior. In excellent harmony with the decor of the room is its furniture, made from the designs of Voronikhin. The console table, the Recamier couch, the armchairs and X-frame stools, carved, painted the colour of antique bronze and embellished with gilding, display a variety of forms and decorative motits. The mahogany bureau from the workshop of Heinrich Gambs is provided with containers for flower pots. This type of furniture, made from Voronikhin's drawings, is to be found only at Pavlovsk. The famous "Voronikhin" washing set, of black, amber-yellow, blue and colourless crystal mounted in chased ormolu, comprises a stand, a flattish basin and a ewer of exquisite beauty. The ewer, made of seven separate parts of blue and colourless crystal, is a mystery of glass making which modern specialists have so far failed to solve. A keen sense of beauty and a highly developed technique enabled Russian craftsmen to create yet another masterpiece, the Green toilet set of porcelain, made for the Pavlovsk Palace in 1800-1 at the St Petersburg Imperial Porcelain Factory. This set includes an octagonal mirror in an ormolu frame with an eagle holding a garland, mounted on a porcelain stand with seated female figures in biscuit. Cupids with garlands, also in biscuit, adorn a pair of dainty porcelain candelabra with ormolu stems terminating in roses which conceal the sockets. 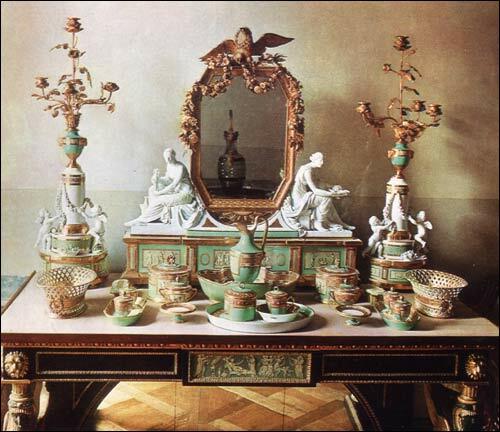 There are altogether thirty-four pieces including a breakfast service, all delightfully shaped and decorated with dainty grisaille painting in reserved panels, depicting classical subjects. The delicate pistachio-green ground colour is beautifully set off by the excellent gilding displaying a relief design of acanthus in bright gold on a dead ground of the same metal. The Green toilet set is representative of Russian porcelain of the classical period, with its exquisite forms, refined colouring and high quality of finish. 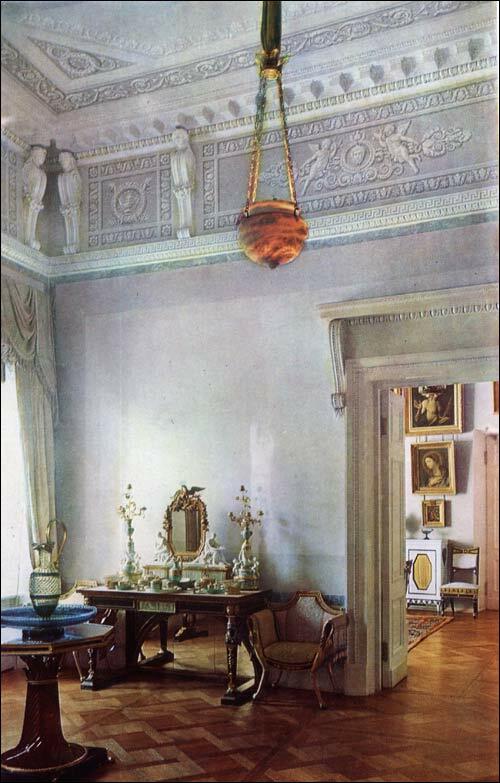 The alabaster lamp suspended on bronze chains is typical of the decor of early nineteenth-century private apartments. It shines with a warm diffused light which gives great charm to the interior.